A great relationship is about two things. First, appreciating the similarities, and second, respecting the differences. This is a simple 5 card relationship spread you can use to check on the state of your relationship and where it is heading if things are left unchecked. Once you have established the cause-effect pattern of your current relationship dynamic, you can pull an additional advice card for how to move forward. 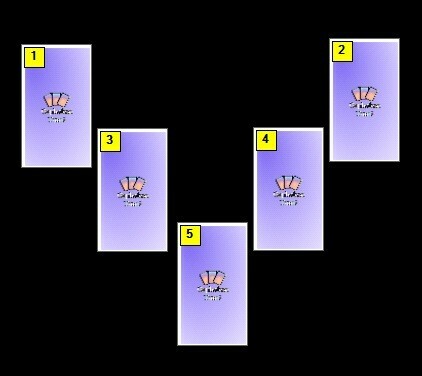 This can be done using either another tarot card from the deck you did the reading with or by pulling an oracle card. Pull an additional advice card if you do this reading for yourself. Pull one advice card each if you are doing it together with your beloved. Have fun and remember to keep things light if you do this a relationship exercise! TIP FOR A LOVING READING ATMOSPHERE: Light a few candles, some rose or jasmine incense and place a piece of rose quartz on the table before you begin the reading. And, most importantly, set the intent to open up to ever deeper levels of love and intimacy!